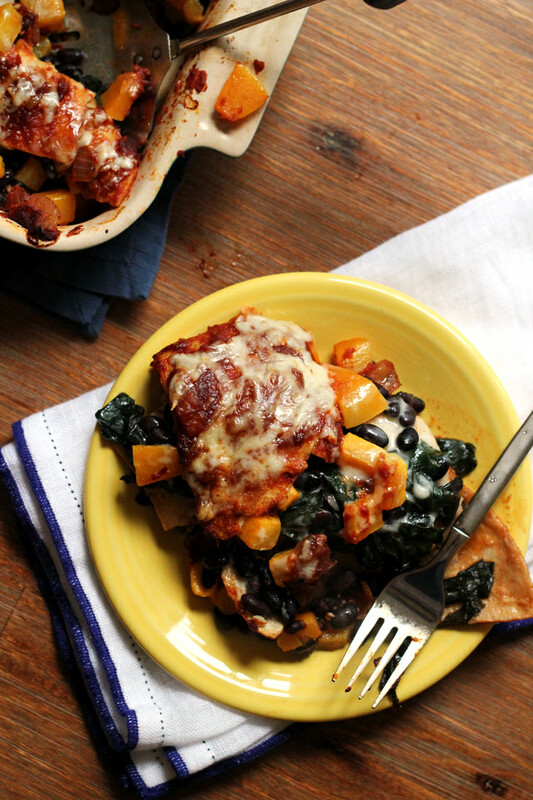 Spicy chipotle enchilada sauce brings bold flavor to this butternut squash and swiss chard enchilada casserole. This weekend I learned that the.boy and I could never share a Pandora station. We’re fine tuning our wedding playlist (/I’m nodding and smiling and pretending to add the songs that he suggests to the list) and while he’s all about the random esoteric but “so perfect” Elton John song. I’m like, how many OneDirection songs can we play before it gets awkward? 18 to infinite would be the correct answer. FYI. Also, I apparently remember 90% of the words to all of the Top 100 songs of the past decade and a half. Why my brain cells decide to retain this information but not a single fact about, you know, MEDICINE, I will never understand. But if there’s ever a life or death situation that depends on me knowing ALL THE SAVAGE GARDEN LYRICS EVER, we’re in luck. Thank goodness. Just like I refuse to cater to the.boy’s musical tastes at our my wedding, I very often refuse to take his taste buds into consideration while making dinner. Some may call this mean, but I like to think of it as life conditioning. Like, if I feed him spice over and over (and over) again, maybe he’ll learn to like it. And if I blast That’s What Makes You Beautiful in his ears every night until the wedding while he sleeps, maybe he’ll let it be the soundtrack to our life wedding video. My latest spice endeavor? This enchilada casserole. The enchilada sauce is wholly homemade and SO easy. Like, it comes together in less than ten minutes easy. And with three tablespoons of chili powder, it is SPICY. Even I had to reach for a glass of cold water a few times while eating it. The.Boy had to relocate so that he was sitting next to the air conditioner, but he survived. This casserole is not all about the spice, though. It’s also about the swiss chard, butternut, black bean filling, which helps to tame the spice so that it’s not all sweat and tears, but also majorly good for you and just plain delicious. And the cheese. Don’t even think about forgetting the cheese. By layering the tortillas in casserole form you save yourself the time of having to stuff and fold each one, making this totally doable on a weeknight. It does take an hour total, but a lot of that is sit around and wait time. AKA prime sit around and brainwash your fiance by screaming top 40 lyrics in his face time. For the enchilada sauce, in a medium saucepan heat the olive oil over medium heat. Add the onion to the pan and saute until translucent, 4-5 minutes. Stir in the garlic,chile powders, cumin, and sugar, and cook for 30 seconds, stirring constantly, or until fragrant. Stir in the tomato sauce and water. Simmer for 2-3 minutes, or until starting to thicken. Season to taste with salt and black pepper. In a large bowl, toss the butternut squash with the olive oil and salt, to taste. Spread in an even layer on a parchment-lined baking sheet. Bake for 30-35 minutes, or until tender. 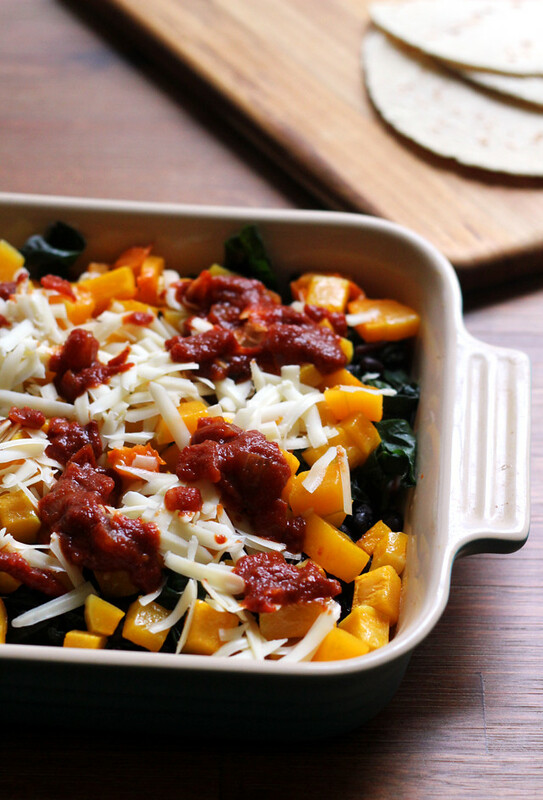 In a large bowl, toss together the butternut squash, swiss chard, and black beans. Season to taste with salt and black pepper. Spread a thin layer of enchilada sauce on the bottom of an 8x8-inch square pan. Top with a layer of tortillas. Spread half of the filling over the tortillas. Top with a third of the cheese and more enchilada sauce. Top with a layer of tortillas. Spread the remaining filling over the tortillas, along with half of the remaining cheese. Top with a final layer of tortillas, a layer of enchilada sauce, and the remaining cheese. Cover with aluminum foil and bake for 20 minutes. Remove the foil and bake for another 10 minutes. Let cool for 5 minutes before cutting and serving. My ears (eyes?) 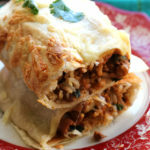 perked up immediately upon the word “enchilada.” I’m thinking this is perfect for a Monday night dinner! 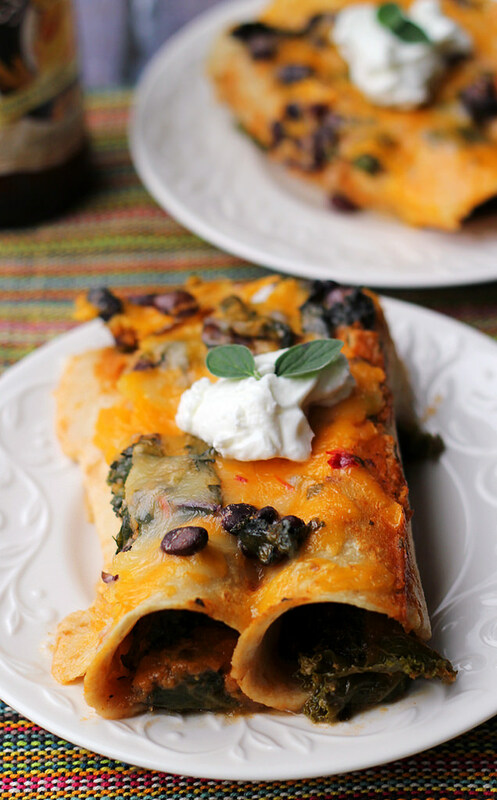 We were going to do some sort of enchilada for dinner one night this week…it may have to be this gem of a recipe!! Looks delish. I always crave spicy dishes during the colder months… Somehow it helps warm the body. This looks like such a comforting meal. One of those that you can curl up on the couch with. Love this bright healthy dish. Mmm…. uhhh get in mi bellayyy!! Loving this vegetarian cassarole! Plus I agree me and my husband could NEVER share a pandora station, polar opposites! LOL! I’d probably have to tone down the spice for my kiddos but other than that it looks perfect! I have a feeling your wedding playlist will be a nice eclectic mix. 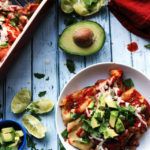 I am a big fan of creative twists of Mexican dishes and this recipe fits right in to that category. I love how seasonal it is and an interesting way to use butternut squash and also get some greens in to the dish. Delicious! This is a great comfort treat, Joanne. It’s not only delicious, also very nutritious with all the powerfood! Holy yum!!! I had a chipotle sweet potato casserole bake for dinner last night and now I want this!!! Yummm!! I’m beginning to realize that your fiancé and my husband have a lot in common. . well, at least with regards to music. We also could not agree on the song list for our wedding so after a lot of nagging, I won. And we walked into the reception to Crazy in Love by Beyonce. . Don’t judge. I love that song. 😛 and the night was filled with upbeat dance party music, with the slower love songs fewer and far in between. 🙂 ok, love this enchilada casserole!!! 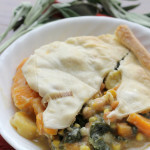 love things like this where it’s so good and your mouth is burning but in a good way. . and the swiss chard, butternut, black bean filling sounds amazing . . I just made veggie taquitos like this!! LOVE!! The wedding playlist! I always imagined this to be one of the funnest parts of wedding planning. Elton John? Always a classic! He had to sit by the air conditioner bahahahaha! Love it. I love spicy and love that this has two levels of spice in it – this is such a unique combination Joanne – such a brilliant dish! Thanks so much for sharing it! BTW, I don’t see why “That’s What Makes You Beautiful” cannot be the music for y’alls life video as well as yalls wedding video! That’s What Makes You Beautiful is so a perfect wedding song. I mean, just have him look at the lyrics. It’s about LOVE. Speaking of love, I love, love, love this casserole. 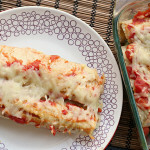 I admitted on another blog that I’ve never had anything enchilada flavored and this might just be the thing to make me go for it! Ooh we should have a Savage Garden sing-off!! I’m the same way with cooking for my husband… and seriously, it works!! He’s actually liked chipotle since long before he met me, so I’m sure he’d love this!! We’re having an enchilada casserole tonight! But with quinoa as the main ingredient. I was tempted to add some sweet potato I had on hand, but last minute decided against it. Now I’m wishing I had thrown in butternut squash. 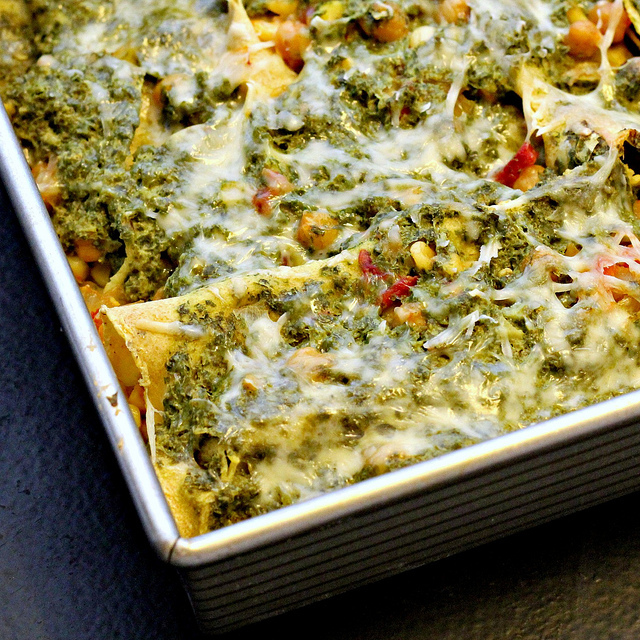 Just love these kinds of casseroles that you can make up and throw into the oven. And I totally agree that you shouldn’t skimp on the cheese! My husband would love this! The spicier the better, he says! Oh man. This looks to die for! I am also pretty sure that’s ing lyrics take up about 75% of my brain space! Not even ashamed. Hahaha I totally support your taste in music and spicy foods 🙂 Love this chipotle enchilada casserole. bring on the spices and all that butternut squash – yum! I promise not to forget the cheese! I love your treatment of greens, Jo. It’s so unique in all your recipes! My mouth is watering… I read “chipotle butternut squash” and I got sooo excited. 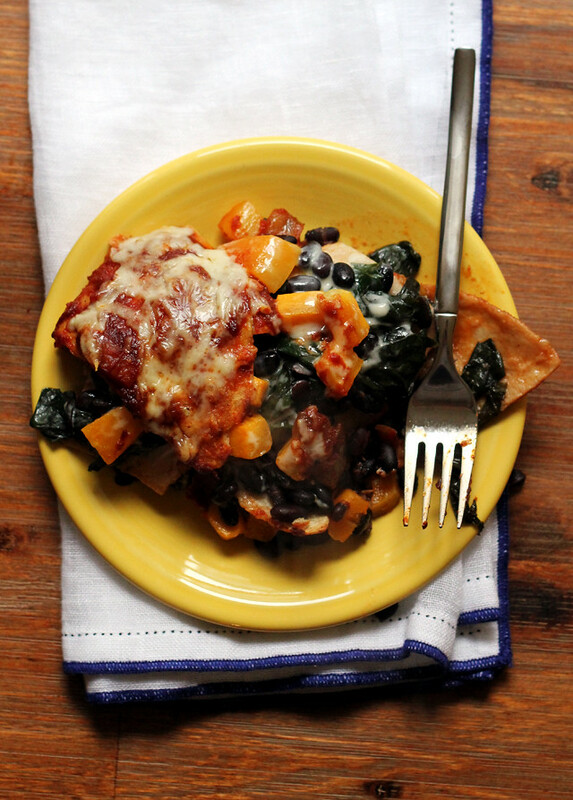 Great enchilada dish, love the spicy sauce and the bean, chard and squash combination is perfect. Umm, yes. 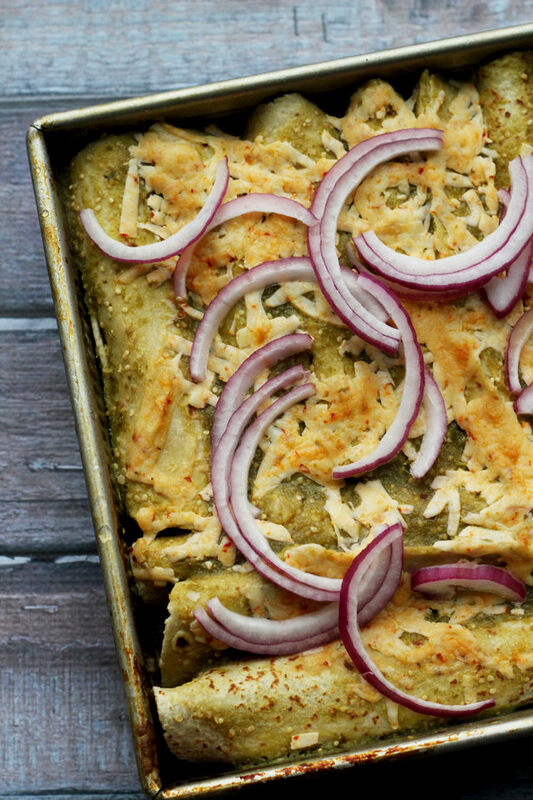 These gorgeous enchiladas have “Monday night dinner” written aaaall over ’em. Totally loving the butternut squash inside! Haha! I don’t really know much about the top 40. I do listen to a lot of music though. I’d totally share a Pandora station with you. Anytime, girl! More importantly (or maybe equally? 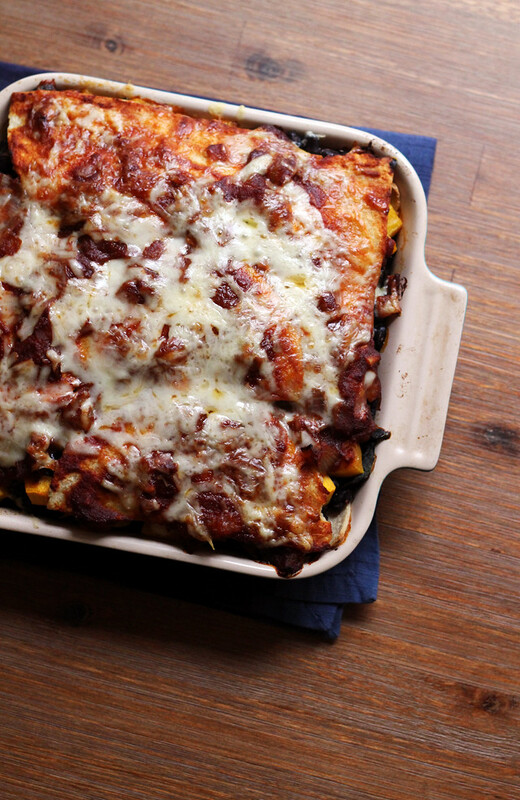 ), I’d chow this enchilada casserole right off your table. I mean, come on. If the boy won’t do in the music/tasting department, I gladly volunteer as tribute 😉 just kidding. I’m sure he’s wonderful. Great share! When you say spicy you’re not kidding! This looks incredibly delicious – I like to think I can handle all that spice. We both have enchiladas on the brain today. That is totally funny about the music list. I wonder if he’ll read this? This enchilada casserole is calling our names! Wondeful and easy meal. I’m so glad you know all the Savage Garden lyrics, as I know all the Backstreet Boys lyrics. So together, we can save the world. This casserole, by the way, is my fire. My one desire. Yum! 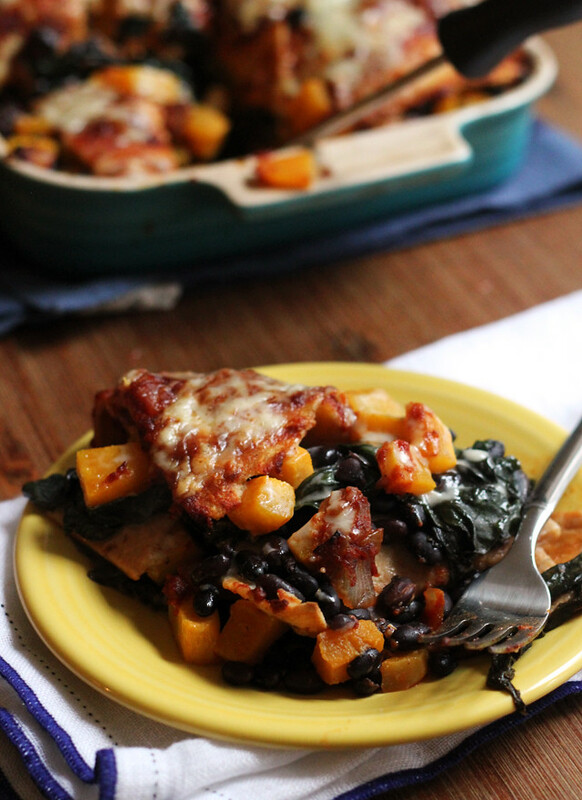 butternut squash and black beans are such a dynamic duo! As you know, our wedding was teeny-tiny. We only had a single guitar player…But I swear I asked him to play all 70’s songs. “I Will Survive” just doesn’t translate well when it’s only the acoustics. 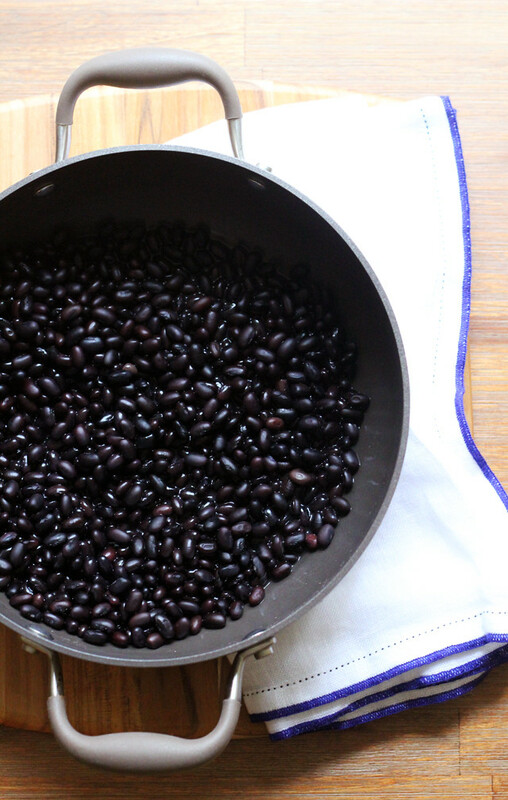 i will never not love a dish packed with black beans. this is so colorful and nutritious and it sounds delicious too. nice one! Picking a wedding playlist with Paul was a nightmare!! We ended up agreeing that I got to pick 75% of the songs and then I was happy. This girl gets what she wants! And now I want enchiladas. Loving that homemade sauce! Now I want to try it in your enchilada casserole! Yum! I recently borrowed a “decorative” butternut squash from the dining hall so I’m hoping I’ll have the chance to do something with it this weekend–maybe with this recipe too! I just made something really similar (no chard, unfortunately) and can I just say how really good it is for breakfast with an egg on top? Like, really good. Okay, this post is perfect. I’m 100% with you on the pandora situation. It’s bad. And also, this recipe looks ah.mazing. I’m going to try it. I’ve conditioned myself to like LOTS of foods over the last several years, spicy ones included. This casserole looks like it would totally hit the spot! 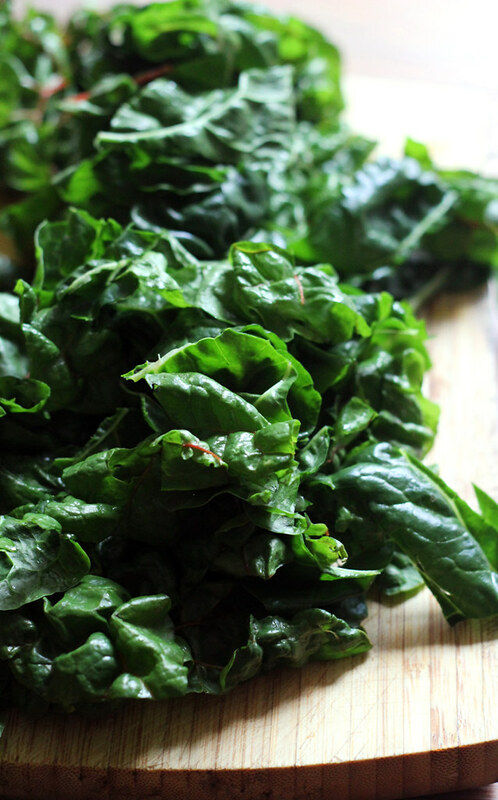 I made these except that I thought I could parboil some red kale I had in place of the spinach. Well, I boiled it and boiled it and it’s still pretty tough. So everything else went into the oven with a homemade tortilla top and bottom crust made from masa harina, since I had no tortillas on hand. I’m always improvising (eyeroll). Now I’ve got to think of something to do with three cups of boiled kale that still isn’t ready for surrender! Anyway, this came out tasty and spicy and everything nicey. Thanks for the recipe!